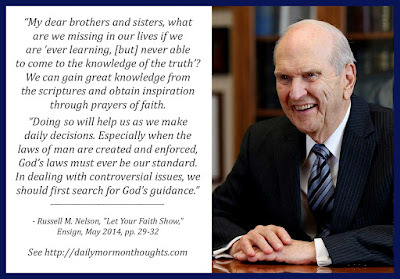 "My dear brothers and sisters, what are we missing in our lives if we are 'ever learning, [but] never able to come to the knowledge of the truth' (2 Timothy 3:7)? We can gain great knowledge from the scriptures and obtain inspiration through prayers of faith. "Doing so will help us as we make daily decisions. Especially when the laws of man are created and enforced, God's laws must ever be our standard. In dealing with controversial issues, we should first search for God's guidance." It seems the world in which we live is becoming more and more secularized; in too many places and too many lives, religion no longer plays a significant role. President Nelson laments the lack of faith; but among the faithful, he is convinced that by living "pure religion" and "striving to become a true disciple of Jesus Christ" we open the way to receiving guidance from above. The concept of "practicing your religion" or "exercising your faith" implies working to develop or strengthen them, as if exercising a muscle or improving a skill. Those are things true disciples must be eager to do, and never hesitate to let faith show. 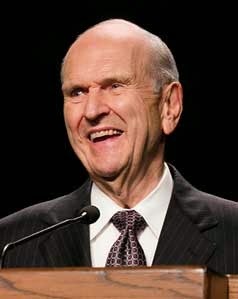 But in the struggle against secularization, President Nelson counsels that scripture study and scriptural knowledge "provides precious protection" for our lives. Our resistance to modern secularization will be much more effective as we have a stronger foundation of scriptural understanding. This is a very timely warning for our day.